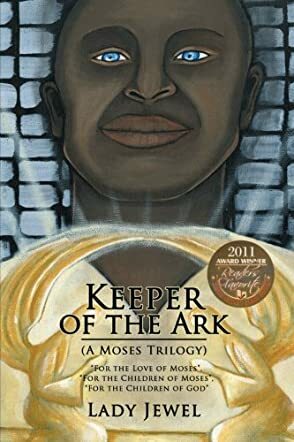 Keeper of the Ark begins in modern times as the narrator reaches Ethiopia and finds St. Mary's of Zion Church where the original Ark of the Covenant is kept. Why in Ethiopia? Because when Moses was still an Egyptian general, he was married to a Nubian princess as a price for keeping Egyptian troops from storming King Kashta's fortress at Saba. The Nubian princess, Tharbis, loves Moses and follows him and the Israelites out of Egypt years later. Tharbis and Moses reunite years later, and Tharbia gives birth to their son, Jonathan, who secretly carries the original Ark of the Covenant back to the monks on the Island of Tana Kirkos. Eventually the Ark is transported to Ethiopia where it remains as this novel begins. Tharbis and Moses' descendants play important roles in the life of King Solomon as the story recounts numerous Biblical characters. The coming and crucifixion of Christ Jesus is detailed, and the last part of the story goes into future times when organized religions take unexpected turns. The Keeper of the Ark covers many, many centuries of Biblical history, often from the perspective of those who were a part of it. The dialogue between characters is well developed and hand-drawn sketches at the beginning of many chapters adds to the text. A map of ancient Egypt, Ethiopia and the land which would become Israel is included, but a timeline of Biblical characters would have been a valuable addition. It would be welcomed by readers who might be overwhelmed by the number of people in this story. The last few chapters go into future years of religion on Earth, and readers of certain religions may be offended by what transpires. Footnotes throughout all chapters as to Biblical sources might lend authenticity to readers unfamiliar with religious history.